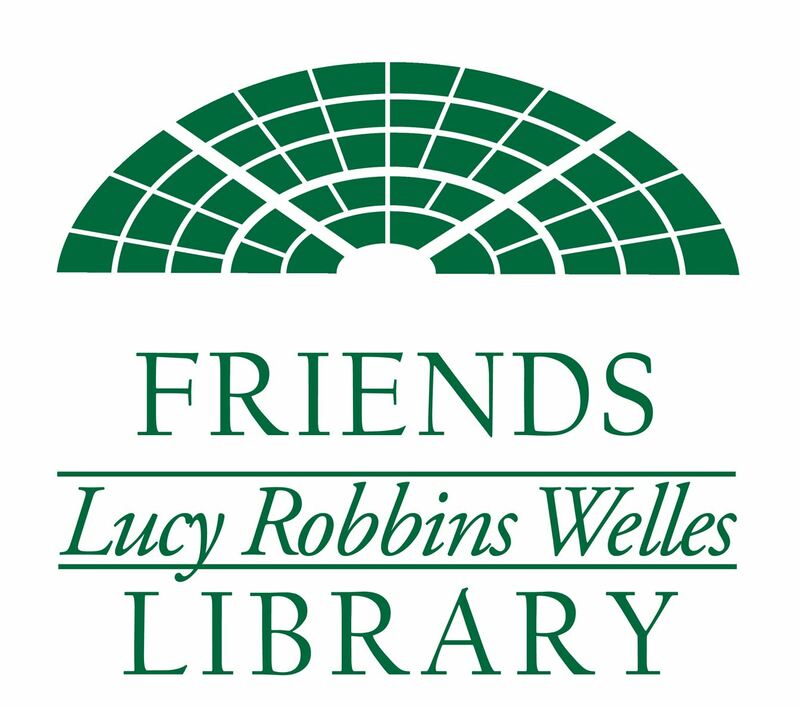 Once a year we take a moment to nominate a great Friend of the Library. This tradition began in 2002 as a way to recognize the amazing work that one individual can do to carry out the mission of the Friends. Nomination criteria is quite simple - the nominee must be a current member in good standing and has gone above and beyond efforts in supporting our organization in meeting it's mission. Nomination Forms are available in the spring at the Library and can be submitted according to the directions on the form. After careful consideration of all the nominations, the Executive Board chooses our recipient prior to the Annual Meeting, usually in May. 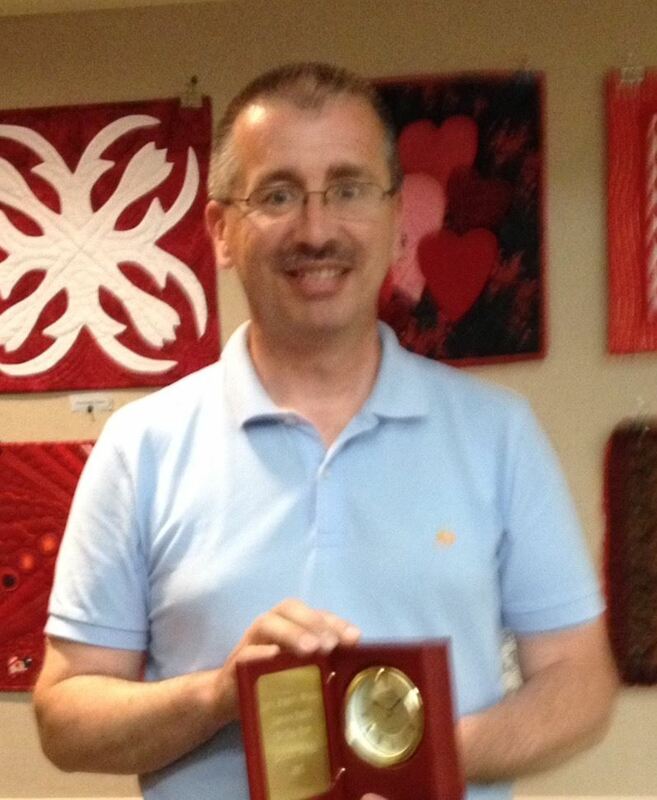 The Award is presented at our Annual Meeting that is held in June. Rudy was more than just a member of the Advisory Board. He was the first to volunteer when a job needed to be done and acted as a true ambassador for the Friends. He left the Board in 2002 and because of all his hard work on behalf of the Friends, became the first Friend of the Year. Ed worked tirelessly in the basement, sorting and packing books for the book sale for over 20 years. He started working on the Book Sale when there was no year round Book Sale Committee. He and his partner, Charlie, along with a library staff member did most of the preparation for the sale. Without Ed there would have been no Book Sale. He has been a true Friend of Lucy. 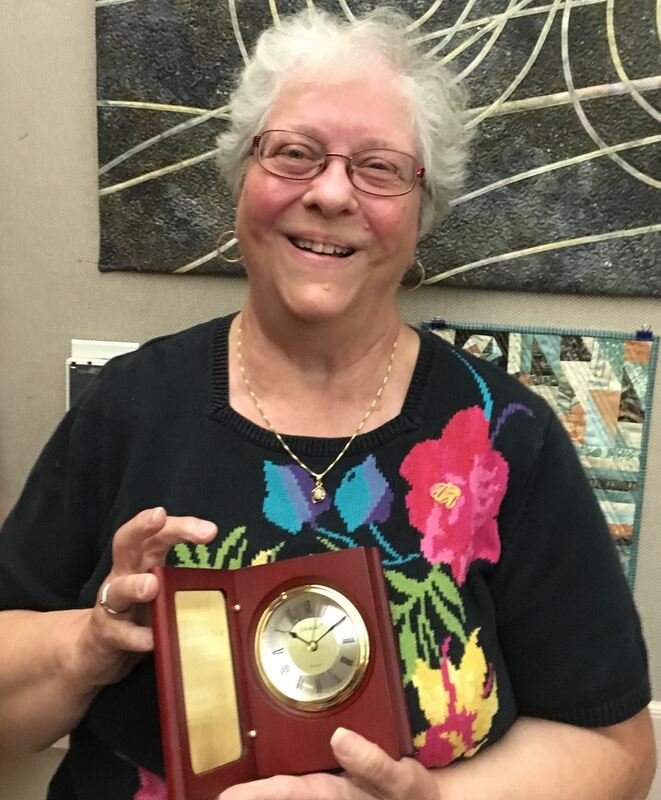 Although Anita has been a Friend of the Library since the 1980's and has held many positions on the Advisory Board, in 2004 Anita was honored as Friend of the Year for her outstanding work as Co-Chair of the Book Sale Committee. The Book Sale reached new levels of success under Anita's leadership, increasing revenues and the Friends' ability to provide the funding for even more programs and materials. 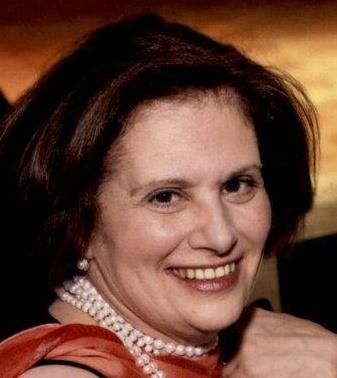 Natalie served as Co-Chair of the Book Sale Committee since 1999 and helped increase the profitability of the Book Sale. The Book Sale moved from the front lawn of the library to Community Center at Town Hall thanks in large part to Natalie's work with the Parks and Recreation Department to first gain permission and then iron out the details. With the move to the Community Center, and later to the Senior and Disabled Center, a third day of sales was possible and the Books by the Bag Sunday Sale was started. Patty turned the Membership Committee into a fine-tuned machine, increasing membership which in turn increased the Friends' ability to fund more library programs and materials. As the Friends' income increased due to the increase in membership revenue as well as the increase in profits from the Book Sales, the Friends' accounting practices needed to be overhauled and Patty took on this task as well. With Patty's hard work, the Advisory Board was able to have greater insight into the Friends' finances. 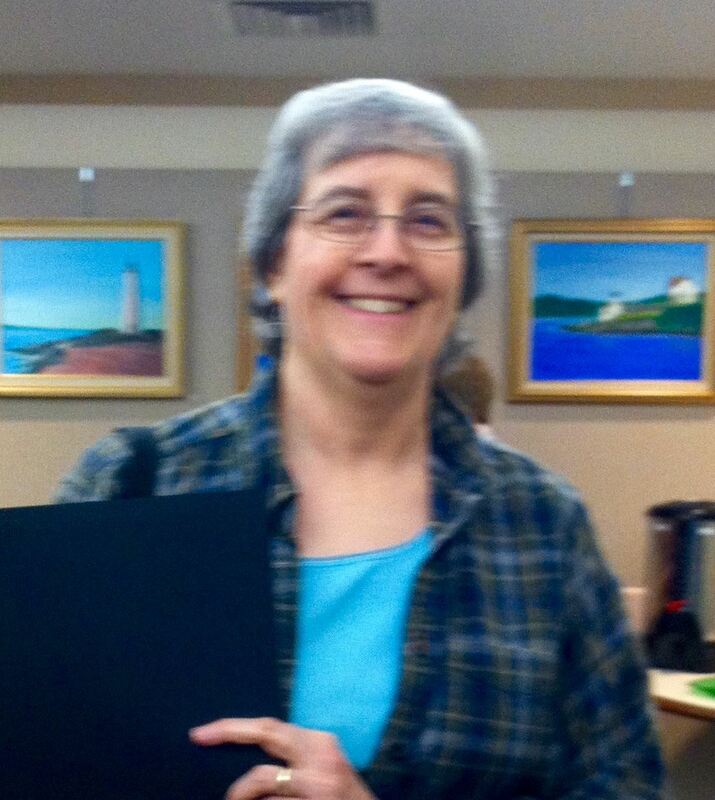 A tireless volunteer, Sue Wright chaired the Murder Mystery Auction as well as the Cookbook Committee. She was frequently found helping with the book sales and many other events. She has been a steady member of the Mailing Committee, getting the newsletter out to the membership. If there was a job that needed to be done, Sue volunteered to do it. 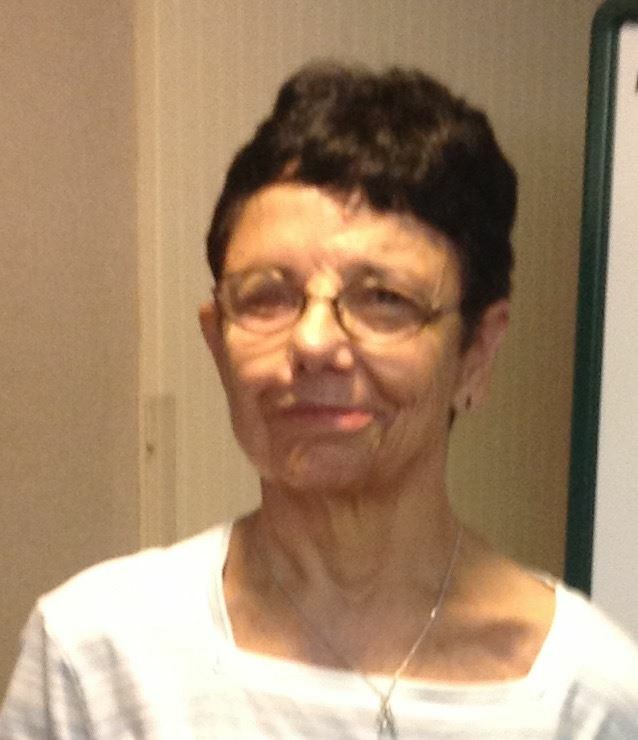 Marcia is a past secretary of the Friends and has served on many busy committees. As a member of the Book Sale Steering Committee, she volunteered her artistic talents to create needed signs to help direct people who shop at the sales. She worked as the Book Sale Volunteer Coordinator for many of the Book Sales, making sure each hour of the sale had the necessary personnel to staff the sale. 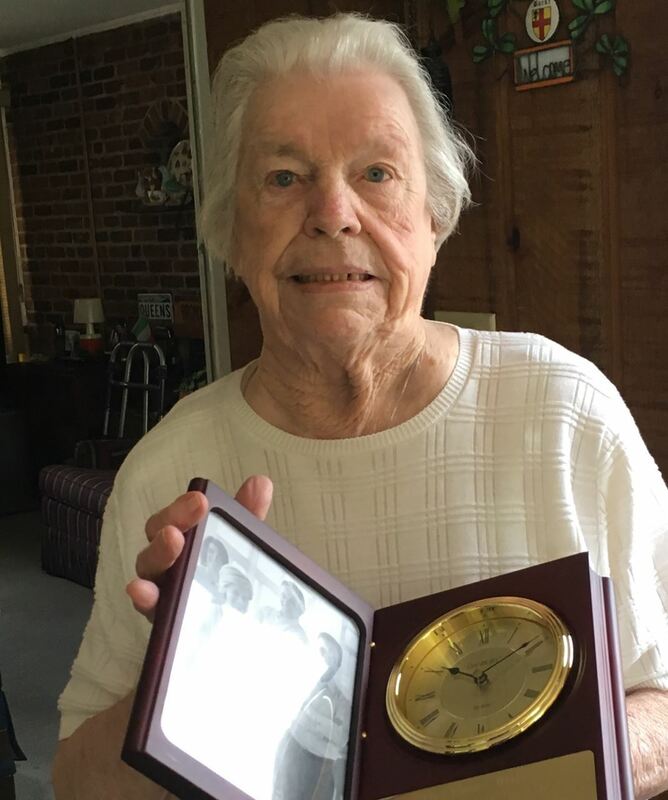 Marcia helped set the standard for the quality of the baskets that were created to be raffled off at the first Wine and Cheese Social and then surpassing her self the following year. If there is a job that needs to be done one of the first to volunteer is Ann. No job is too small or too large for Ann to tackle. She has worked tirelessly to insure the success of our Book Sales, first as a Screener/sorter, then a member of the Steering Committee and then as Chair to the Book Sale. If that wasn't enough, when the Membership Committee needed a Chair, she took that job on as well. Fred has volunteered for the Friends in many capacities. He has been on the Mailing Committee and regularly delivers the Footnotes & Calendar of Events to the Bulk Mailing Postal Center. When an odd job needs to be done, such as purchasing enough water for the 5K Race or setting up tables and chairs at various Friends' events, Fred answers the call for help. 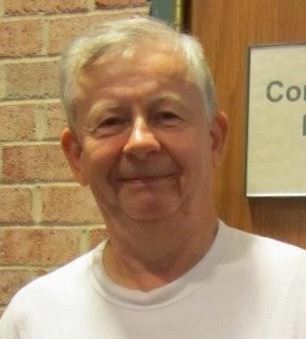 He served as Friends' Treasurer for 3 years. Fred is a regular volunteer for Book Sales, not just for the sales themselves but year round. When the Ongoing Sale needed a sales manager, Fred added that job to his list of things to do. The Library Staff knows Fred well and relies on him to come to their aid when needed. 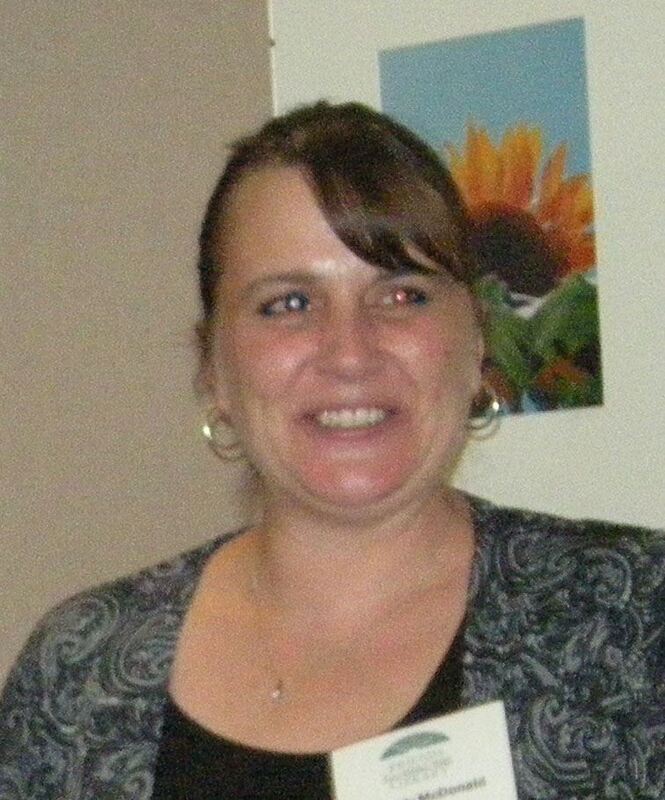 Christy McDonald has been a volunteer extraordinaire this past year. When the Friends had an opportunity to participate in Macy's Shop for a Cause, Christy took over as coordinator and what a job she did! By the time all tickets were sold, the Friends were one of the top ticket sellers and were invited to sell tickets at the event itself. No sooner did that event end and Christy took on the job of coordinating Library Card Sign-up at the Polls on Election Day. Working her way thru red tape and other problems, Christy was able to make sure 3 polling places were staffed with volunteers that introduce library services to newer members of the community, helping many of them complete applications for library cards. Kathleen Holland may not appear to be a powerhouse but looks are deceiving. Kathleen is another one of Friends' volunteers who works tirelessly behind the scenes to help with Friends' events. Screening and sorting books for the book sale year round, serving on the Book Sale Steering Committee, working at the Friends' booth at the Business Showcase or Water Fall Festival, helping with the Wine and Cheese Socials, entering membership data and participating in mailings are a sampling of the tasks Kathleen takes on to help the Friends. Dori Womer not only sorts books year round for the Book Sale she has served as the Book Sale Volunteer Coordinator through several sales and the Fiction Room Captain for even more. Working behind the scenes at the Wine and Cheese Socials, she has helped make sure every thing runs smoothly and has helped the Social grow bigger and better each year. 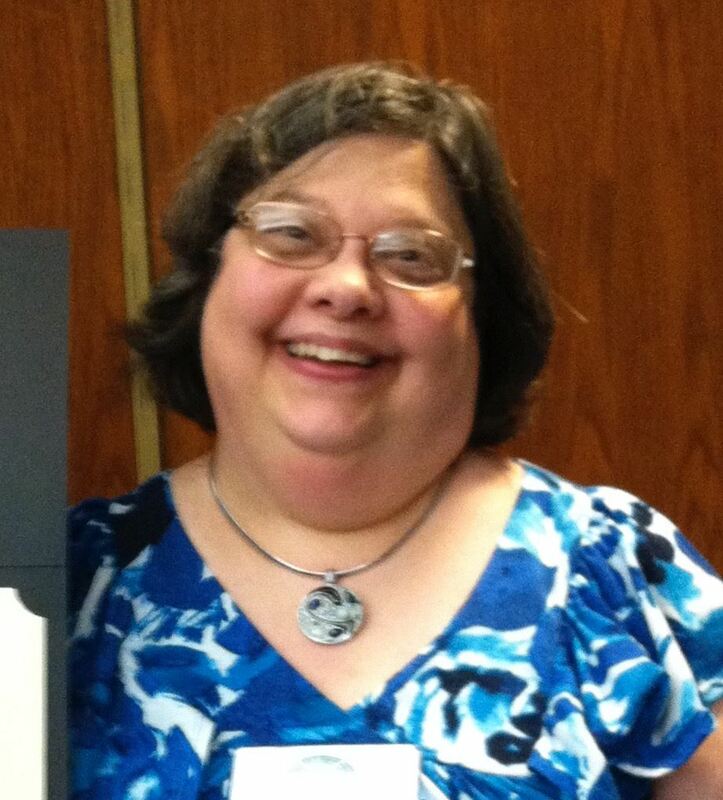 Our 2014 Friend of the Year has chaired the Wine and Cheese Social Committee for multiple years, serves on the Book Sale Committee as well as working year round as a book sorter, and has coordinated Treats for the Staff during National Library Week. Carol is a willing volunteer for what ever project needs volunteers. In addition she is a valued contributor at Advisory Board meetings. What hasn't Brian volunteered for to help the Friends? Not very much. He has served on the Executive Board as Treasurer, Vice-President and President for multiple terms. Book Sales would not be the same without Brian. From set up to clean up, Brian is everywhere helping the sale run smoothly. Through out the year, Brian continues to work on the book sale, packing and moving boxes of books. If the Friends are participating in the Business Showcase, Water Fall Festival or any other event, Brian is the "go to" person, calmly making sure the booth is set up and taken down. Brian is the definition of a Friend of the Library. If you enjoy receiving your Footnotes in the mail, then JoAnn is the one to thank! JoAnn has been the Chair of the mailing committee for many, many years. She is responsible in making sure the Mailing Committee meets regularly to fold, label and sort the Footnotes, preparing them for mailing. But her volunteering does not not stop there. 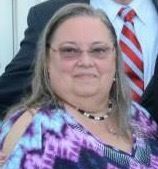 She is a frequent volunteer at the majority of Friends' Events including the Wine and Cheese Social, the Waterfall Festival, the Business Showcase and other events if needed. When you look up volunteer in the dictionary, there should be a picture of Kaye to illustrate it. 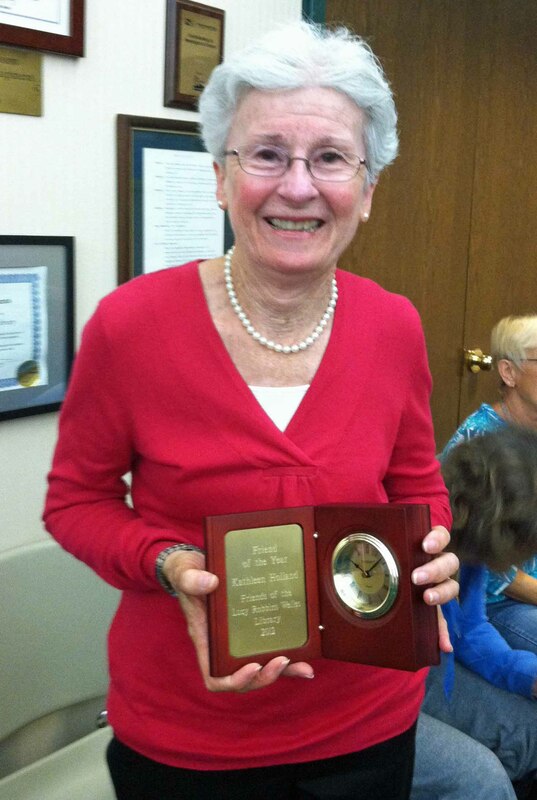 Kaye has devoted years of volunteer time to the Friends of the Library. She was one of the first Book Sale volunteers back when the book sale was held only one day a year, the Saturday before Mother's Day, on the front lawn of the library and continued to volunteer right through the Spring 2017 Book Sale. Not only does she volunteer at the Book Sales but has also been a "basement dweller" working on sorting, cleaning and packing books all year round. 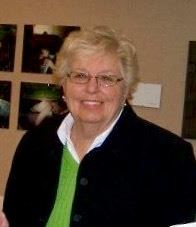 Kaye served on the Advisory Board for many years, volunteered regularly for the Waterfall Festival and Business Showcase and any other event that needed volunteers. Although Kaye is the 2017 Friend of the Library she is also a true Friend of the Library through the Years. Carol is one of our hardworking, behind the scenes volunteers, who works down in the book room sorting children and teen books and all she seems to want is the occasional Twizzler or two. She does surface twice a year to be at the book sale, working to set up the children's room and then working the sale all three days and none of us can imagine a sale without her. No one can remember when Carol started volunteering but it has been many, many rears and every children's and teen book that has sold at our sales since she started volunteering has been touched by Carol at least once. The book sale counters often hear comments about how well organized the children's room is and how helpful the volunteers are and Carol is half of the team that our customers are talking about. Carol always suggests ways to improve things and her ideas keep making our sales better.